A YouTube video that tea lovers will love! Okay, I should have shared this tea company's video here first, but I just wasn't thinking and shared it on Facebook the other day instead. The video got so many positive comments, even from friends who aren't big tea drinkers, that I realized everyone found this as entertaining as I did! I learned about BOH Tea, by the way, when I got an email from them offering to send me some tea samples. I hear it's actually good tea, and I said sure, of course. And now I look forward to receiving this tea and trying it for myself! "That high tea was great," the customer with the grand bust said to me. "I'll be telling all my friends about this place." "What high tea?" I said. "Oh, you mean afternoon tea. You really shouldn't get those mixed up. High tea, sometimes just called tea, is what the working man calls his dinner, and afternoon tea is what you had." Tea lovers, I just finished a new cozy mystery that I think you'll enjoy as much as I did, and I particularly love the premise of this one. In the small town of West London, Massachusetts, Gemma Doyle runs a Sherlock Holmes Bookshop and Emporium at 222 Baker St. (221 Baker St. wasn't available). Gemma is English but came to America to help her Great Uncle Arthur run his bookstore, and they also own half of the business next door, Mrs. Hudson's Tea Room. The bookshop sells all things Sherlock, including not only books but also such items as busts, puzzles, mugs, dish towels, and the occasional rare collectible. 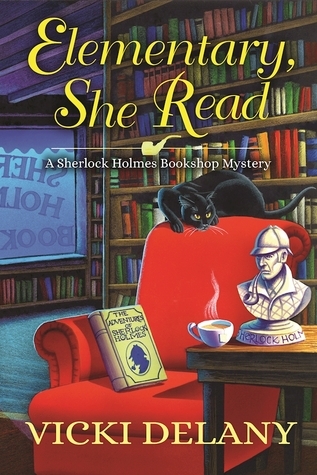 A near-priceless issue of a magazine that published the first Sherlock Holmes story lands in the shop under some highly unusual circumstances, and when Gemma—along with her tea-shop-owner friend Jayne—tries to restore the magazine to its rightful owner, the two come across a dead body and find themselves suspects in a murder investigation. Like her store's namesake, Gemma possesses some amazing powers of deduction. It's great fun to watch her do things like introduce herself to a character she's never met before, getting the person's identity correct based simply on her powers of observation. The author gives us plenty of red herrings, the requisite dust-ups with local law enforcement, and, of course, enough cups of tea to make us all want to go browse through the book shop and order "afternoon tea" at Mrs. Hudson's Tea Room. The second book in the series hits shelves September 12, and I can't wait! 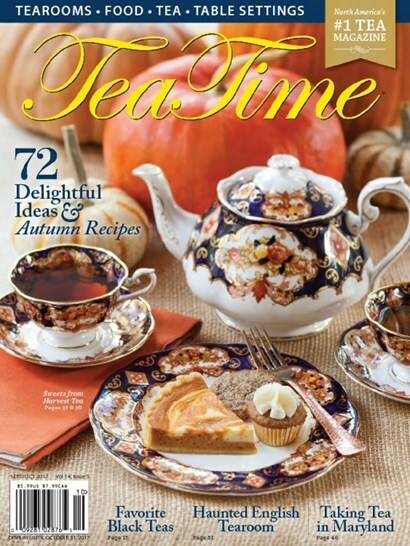 I always love seeing what will be on the cover of the new issue of Tea Time magazine, and this time, the pattern was one that's quite familiar, this rich blue-and-gold-toned Heirloom pattern from Royal Albert. This pattern is featured (third from top) on the cover of my book Teatime Tales. 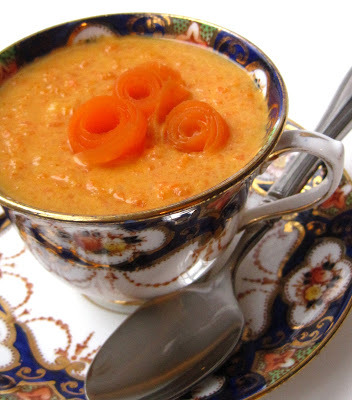 I guess everyone sees "fall" when we see this Heirloom china, because I served a yummy fall-ish carrot soup in mine. (The recipe is here.) I don't know about you, but I do my best cooking and baking in the fall. When the weather turns cooler, I love to spend time trying out new recipes, and this new Tea Time has some great ones, from a curried egg salad that I would *not* reserve just for teatime to a chocolate-drizzled peanut butter shortbread whose photo made me want to lick it right off the page. This issue definitely has me drooling ahead to fall. Are you a fall baker too? 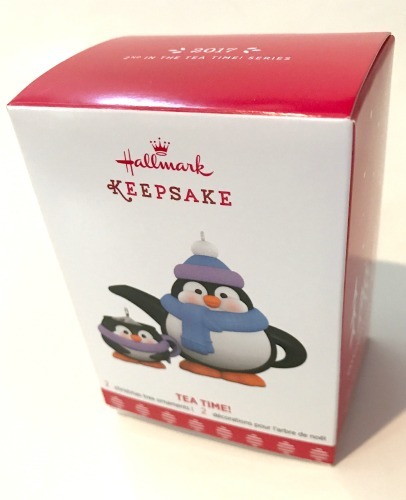 This year's Hallmark Tea Time ornaments! 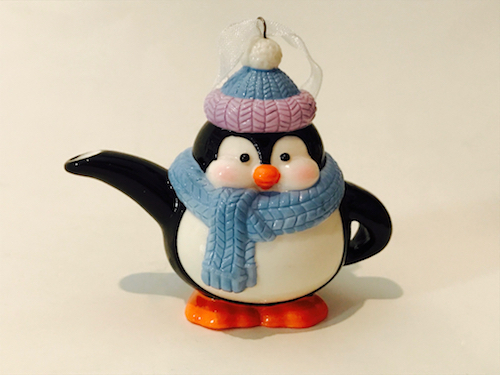 While I've bought a few vintage Hallmark ornaments online and at antique malls over the years, I've rarely collected any tea-themed ornaments the year they actually were introduced. 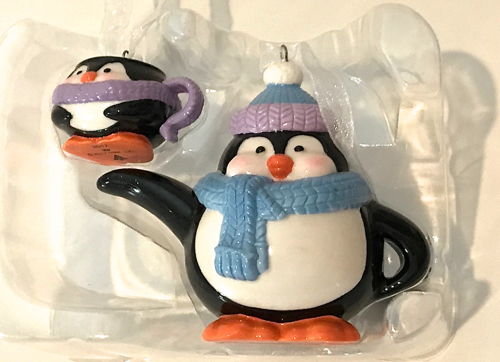 Last year, however, I bought the first ornaments in the Tracy Larsen Tea Time ornament series, and over the weekend, I bought the second set of teapot-and-teacup ornaments, these cute little penguin guys! And here's the teacup and teapot both in the package insert. (I love that they are packaged so carefully in the insert, so hopefully these will stay safe through the years and truly end up being "Keepsake" ornaments.) Are any of you collecting these ornaments as well? Got yours yet? Alex's book is released this week! Here's a brief description of the book: "Southern humorist Alex McRae shares a collection of his award-winning newspaper columns. From possums and puppies to donuts and dating, these columns are guaranteed to make you laugh, cry or get mad. If you like down-home humor with a side of sass, you won't be disappointed." 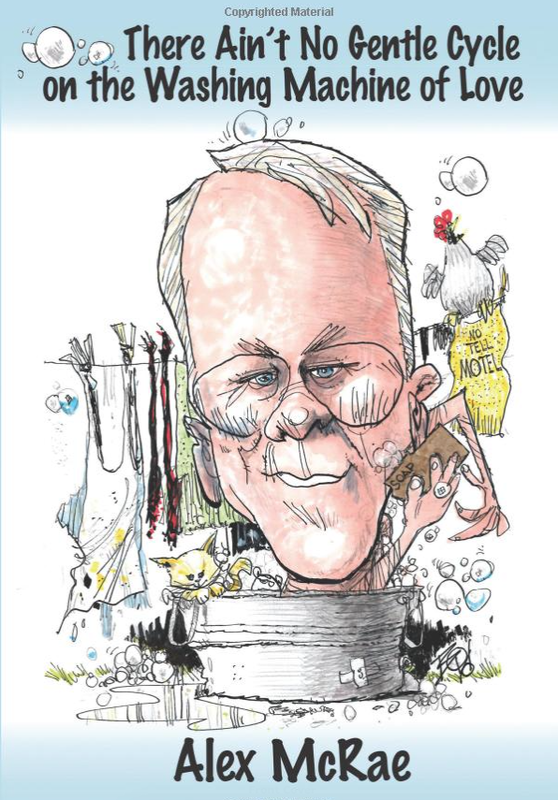 His illustrator and friend David Boyd Sr. will be on hand, and Mrs. Earlene Scott, beloved Newnan bookseller, is coming out of retirement to supervise the signing. It should be a fun afternoon, and for those of who know and enjoy Alex's work, I'd love to see you there! The Grandmother of the Fairy Gardens! Friends, do I have a treat in store for you today! And this is purely thanks to the kindness of a reader, Pam P., who recently sent me an email and shared photos of some of the fairy gardens she and her grandchildren have made this summer. When I asked whether I might share them here, she graciously said yes, and I hope you'll be as inspired by her ideas as I was! Here is Pam's own fairy garden. 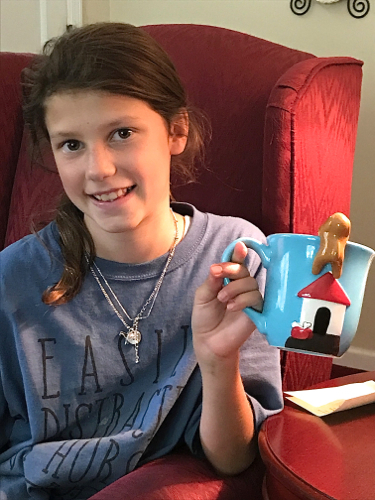 Here is Pam's granddaughter Lainey, 14, with her fairy garden composed in a beautiful ruffled container and sporting several levels of interest. I had not considered elevating a feature within a fairy garden, but what a great idea! And here is a more detailed shot of Lainey's garden. "We made the little table for the cup and saucer out of rocks and jewelry-making pieces," Pam said. Brilliant! For this scene, Pam said, the tiny cups and saucers on that darling little table and chairs are actually *jewelry charms* from Michaels! And while grandson Carter isn't pictured (and probably wouldn't want to be featured on a tea blog! ), Pam did share the "man cave" he made, which I thought was a terrific twist on this idea, and one some of you may wish to keep in mind if you have young grandsons or nephews who might like to make one of these. She said Carter's container is a pot his dad uses when camping, and the "ladder" on the side is made out of Lincoln logs! — Shop thrift stores for unusual containers for fairy gardens. — "Nature provides beautiful items for decorating them as well." White rocks and river rocks work nicely, she said. — At Michaels, the fairy items and the miniatures are on opposite sides of the store, Pam pointed out, so check out both. I hope to have my fall-themed, tea-themed fairy garden up and in business within the next week or two, so stay tuned. And special thanks to Pam for sharing all these great photos and ideas! Ruthie Miller! And I've just sent you an email so that I can see about getting this in the mail to you. Thanks to all who entered! Who was growing tea in 1813? We were! I find that the tea-tree grows perfectly well in the open air near Charleston, where it has been raised for the last fifteen years at M. Noisette's nursery. Tea, as exported from China, would cost too much in the preparation, for each leaf goes through a particular process there. 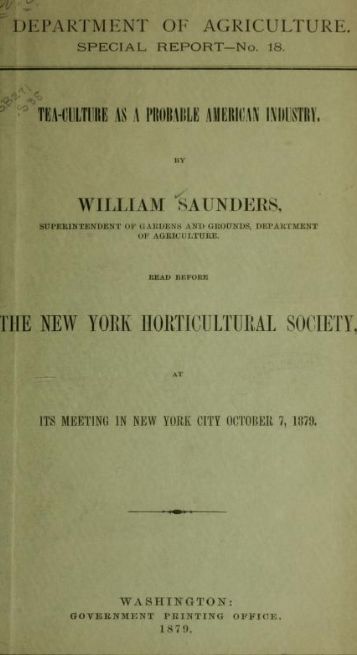 But, as this is probably done with a view of economizing room and preserving its freshness in the long sea voyage to which it is exposed, we might, in raising it as a crop, use it and export it, at least northwardly, dried in the same manner as senna or hops." So, if my calculations are correct, if in 1828 tea had been growing for 15 years in M. Noisette's nursery, that means tea was growing near Charleston in 1813, much earlier than I'd believed! The piece goes on to mention efforts by a Junius Smith to grow tea in Greenville, S.C. "about 1848." And 1848 is also the earliest date I have found for Dr. Charles Shepard's tea-growing experiment at Pinehurst Tea Plantation in South Carolina, which provided some of the plants that later became part of the Charleston Tea Plantation. Yet another fun discovery in the never-ending history of tea! 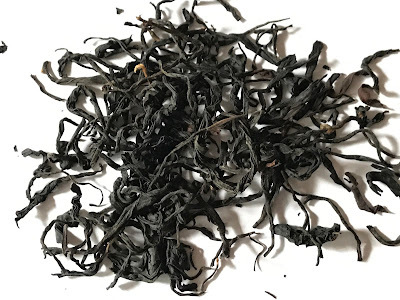 Wild about Teavivre's Wild Tree Black Tea! 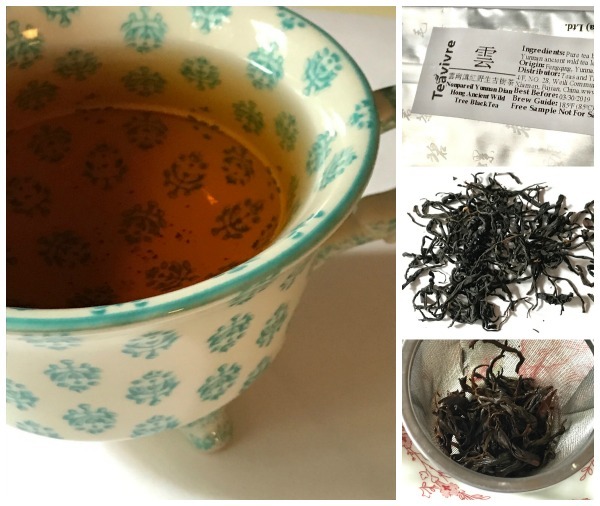 This week I got around to sampling a new tea I recently received from Teavivre, their Nonpareil Yunnan Dian Hong Ancient Wild Tree Black Tea. As soon as I opened the package, I got the sense something was different about this tea. The scent was similar to fresh wood shavings but with a pleasantly musky note as well. The thin, wiry leaves were a deep, inky black, with a few of those golden bits you find in Yunnan teas. Here's what the website says about this tea: "The local tea tree is Fengqing large leaf species, (which) can produce thick tea leaf. Our Ancient Wild Tree black tea then has large, strong leaves. The dry tea is glossy and dark, covered with thin pekoes. Its full aroma and bold taste can be revealed when brewed, as well as the particular strong taste which brings a characteristic of raw pu-erh to this black tea." 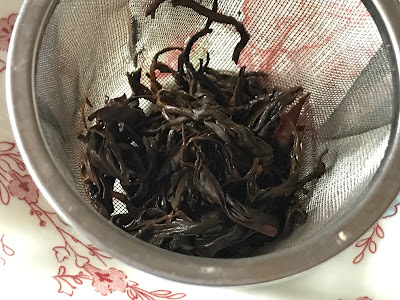 Steeped, the tea had a somewhat smoky fragrance, a pleasant one, and the taste was rich and layered, so much so that I detected different notes with each sip. A rich black tea? Yes, but also smooth and with a taste that, for some reason, made me go, "Aah, fall is on the way." And all that in an unflavored black tea. I was impressed and look forward to enjoying more cups of this fine tea! 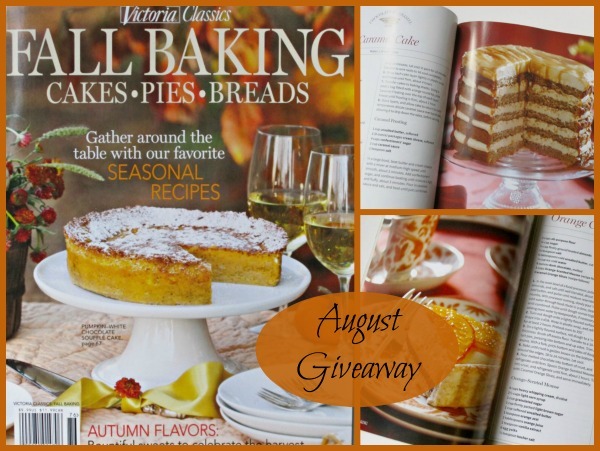 Fall is not officially here yet, and won't be for a while, but the fall magazines have started to hit the newsstands, and the Fall Baking issue from Victoria Classics is one of the most tempting fall issues I've come across in ages. From the Pumpkin-White Chocolate Soufflé Cake on the cover to the mile-high Caramel Cake, at top right, and Orange Chocolate Caramel Tart, at bottom right, these treats look amazing. Some of the recipes are for individual serving size treats that would be perfect on the tea table, including the Cappuccino Blondies and Chocolate and Sea-Salted Caramel Nut Tartlets. So if you'd like to win a copy of this issue for yourself, just leave a comment to this post between now and 7 a.m. Friday, Aug. 18, telling me which of the five recipes I've mentioned here sounds *most* appealing to you, and you'll be entered to win. And please make sure you've included an email address where I can contact you if you're the winner. Good luck! Lately I've been spending many of my free hours of the weekend stitching. Last weekend I finally finished the last block of a quilt I've been working on for years, and I've been inspired to start shopping for fabrics again so that I'll have plenty to see me through the fall and winter. 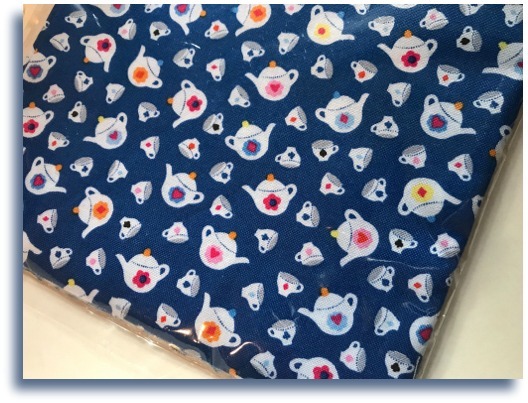 When I came across this new teapot-and-teacup fabric, I wanted to be sure to share it here. 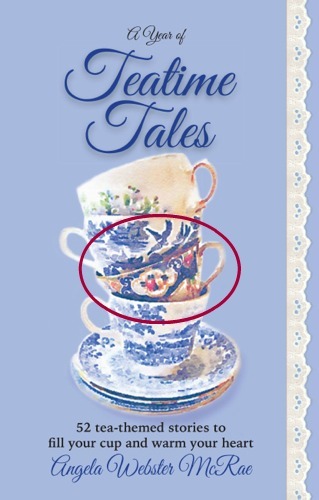 I ordered it from the Fat Quarter Shop, and it's called "Royal Teapots" by Timeless Treasures. I love how they even package their fabrics in plastic, so it's protected from dust until I get a chance to use it one day! 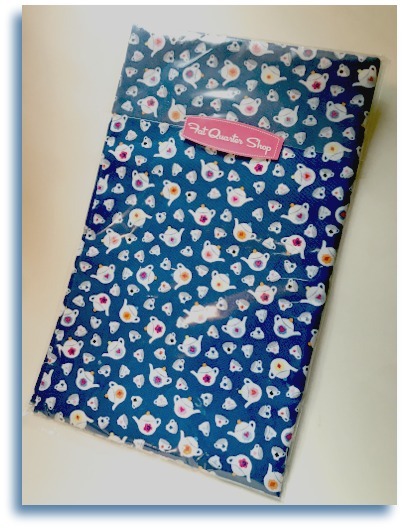 I've started collecting dark blue fabrics for a tea-themed quilt I've long had on my to-do list, and I knew that by the time this quilt moves to the front of the line on my project list, this fabric won't be around any more, so I decided to get it now. And that prompted me to see what other tea-themed fabrics are out there these days. So for my fellow stitchers and crafters, here are a few of the ones I've found, some of which were shared with me by blog readers! And if you know of any other fun new teapot and teacup fabrics, please feel free to share a link in the comments, because I know I'm not the only one who would like to know! Once a quarter, my very fun, very sociable Sunday School class brings in breakfast to share. Last quarter, I decided to make one of those yummy sausage, egg, and cheese casseroles. Unfortunately, so did all the other women, and the table in our classroom was a sea of cheese-topped 9 x 13-inch dishes. Sigh. 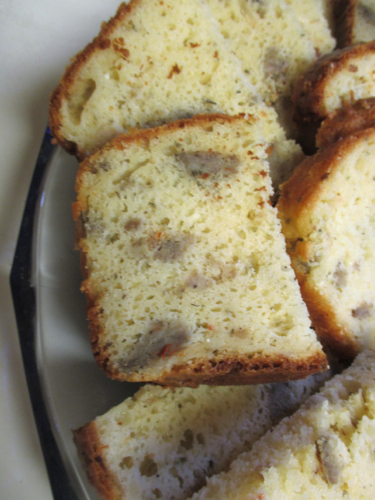 So for this past Sunday's gathering, I had found a recipe for a fancy-schmancy sausage bread recipe. I would take a breakfast bread this time! And wouldn't you know it, so did everyone else. We had muffins, banana bread, biscuits, some type of pastry, and one lonely egg and cheese casserole. You have to fight for a spot on the crowded table, and my tray of sliced sausage bread, I am told, looked like a second plate of the banana bread that appeared at the beginning of the table, so Alex and I came back home with most of it. That is actually not bad news, my friends, because this stuff is delicious! I made this bread with a mild sausage, both Parmesan and white cheddar cheeses, and a tiny amount of hot sauce, which wasn't hot at all but added a nice flavor to this bread. And when you warm it up again? I guess the sausage keeps the bread moist, because oh, is this bread good. In fact, the rest of the loaf is almost gone now. And here's the recipe I used if you'd like to try it for yourself. 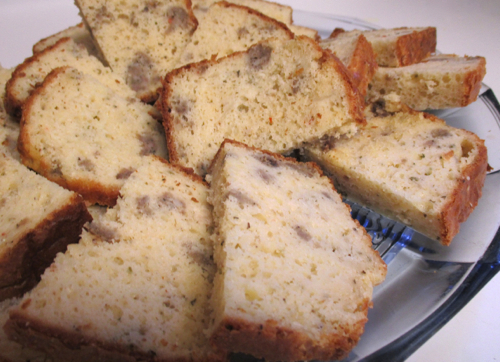 I'm thinking this would be a nice "savory" to serve at a breakfast or brunch type of tea event, but some people don't seem to like sausage on the tea table. If it's a mild sausage, I do. Where do you stand in this debate? Any sausage lovers reading today? 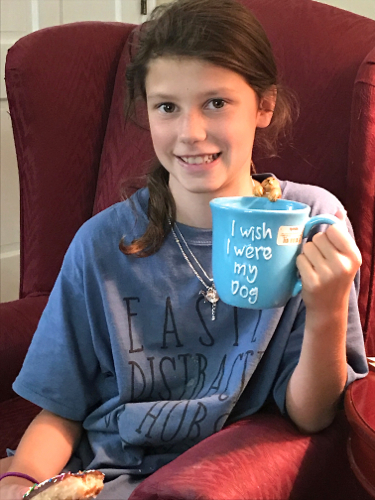 Many of you have been reading about my youngest niece, Amelia, for years on this blog, so I thought you might enjoy an update since she graced Aunt Jane and me with her presence for a shopping day on Saturday — a rarity with a 12-year-old who's usually too busy keeping up with her 18- and 21-year-old sisters! 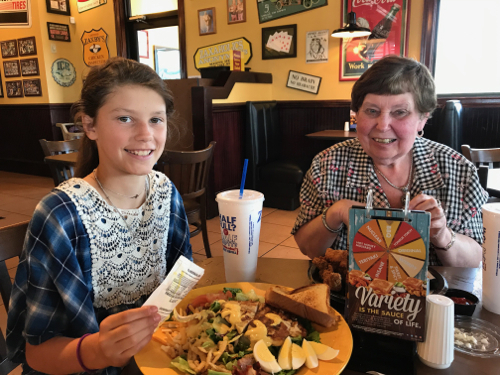 Here are Amelia and Aunt Jane having lunch at Zaxby's. Amelia is crazy about dogs, horses, and pretty much any animal she's ever come across. When she grows up, she wants to be a veterinarian's assistant so she can work with animals all day. I asked her why not a vet, but she doesn't want to go to school that long, she says. We'll see. Her home currently has chickens, goats, a cat, two dogs, and a miniature donkey. 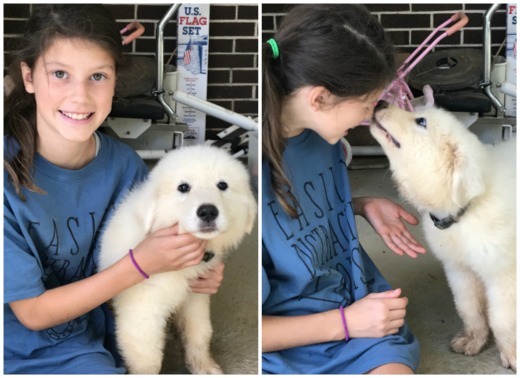 Amelia absolutely adores her Great Pyrenees, Lily, so she decided that Lily needed "a husband," and that meant she saved her birthday money and got Luke, who seems quite taken with her already. She introduced me to him as soon as I arrived. When we were in a T.J. Maxx on Saturday, we came across a great new "tea mug" that is perfect for Amelia. It says, "I wish I were my dog." 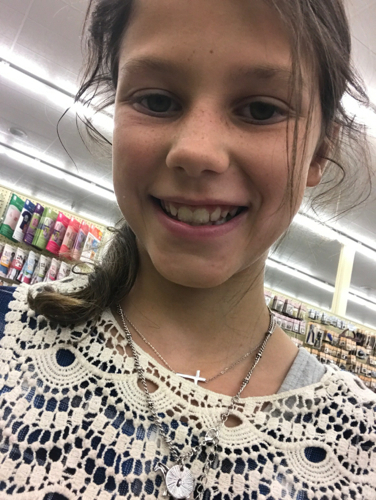 It was a fun day, and after we got back from shopping, I was flipping through the photos on my phone when I discovered a selfie she had taken when I asked her to hold my phone at one point. Cute reminder of a fun day with this sweet girl! Have you seen any new tea books you'd recommend? I haven't, so I headed to Amazon and looked for tea books that are going to be published soon. I found quite a few titles that interest me, so I thought I'd share them here. 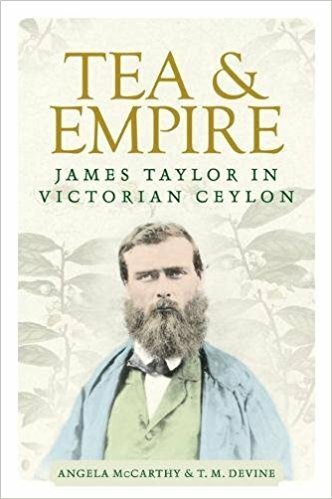 Tea & Empire, James Taylor in Victorian Ceylon by Angela McCarthy & T.M. Devine (coming September 19, 2017). The blurb: "This book brings to life for the first time the remarkable story of James Taylor, 'father of the Ceylon tea enterprise' in the nineteenth century. Publicly celebrated in Sri Lanka for his efforts in transforming the country's economy and shaping the world's drinking habits, Taylor died in disgrace and remains unknown to the present day in his native Scotland. Using a unique archive of Taylor's letters written over a 40-year period, Angela McCarthy and Tom Devine provide an unusually detailed reconstruction of a British planter's life in Asia at the high noon of empire." 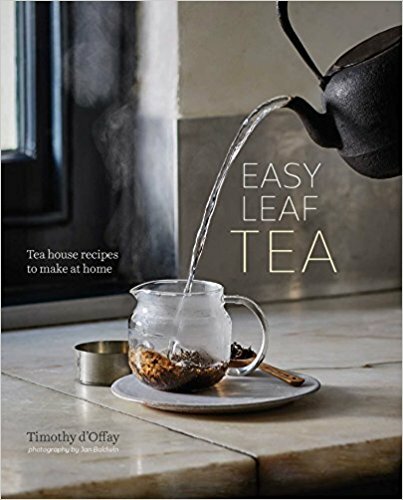 Easy Leaf Tea: Tea House Recipes to Make at Home by Timothy d'Offay (coming November 7, 2017). 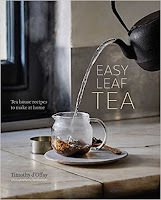 The blurb: "Tea expert Timothy d’Offay starts with the very basics with a section on water and tea tools to make brewing easier, like the hoop jug that helps you get the water temperature right for your green tea in an instant and with minimal fuss. Then, as well as traditional ways of making tea, he explores new brewing methods such as Flow Brew, which involves brewing one tea through another to create an infusion, and Ambient Tea, a way of making tea pair better with food. There is a Cold Brew chapter as well as one for delicious sparkling teas, called Kitchen Colas, which you can make in the comfort of your own home with tea and a few other natural ingredients." 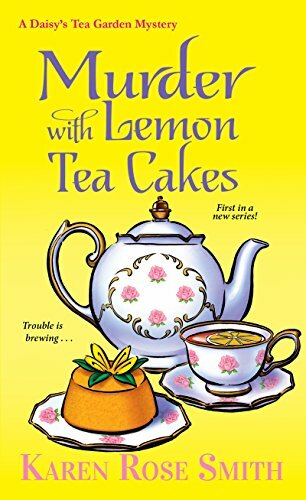 Murder with Lemon Tea Cakes by Karen Rose Smith, A Daisy's Tea Garden Mystery (coming Dec. 26, 2017). The blurb: "Daisy, a widowed mom of two teenagers, is used to feeling protective—so when Iris started dating the wealthy and not-quite-divorced Harvey Fitz, she worried … especially after his bitter ex stormed in and caused a scene at the party Daisy’s Tea Garden was catering. Then there was the gossip she overheard about Harvey’s grown children being cut out of his will. Daisy didn’t want her aunt to wind up with a broken heart—but she never expected Iris to wind up a suspect in Harvey’s murder. 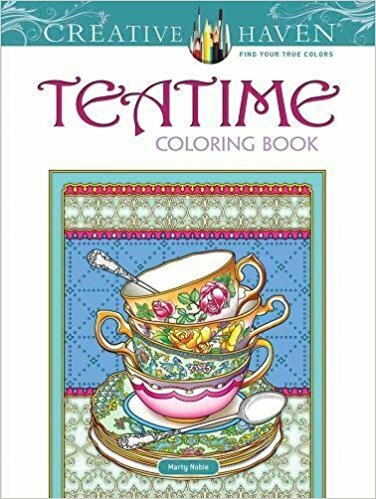 Now the apple bread and orange pekoe is on the back burner while the cops treat the shop like a crime scene—and Daisy hopes that Jonas Groft, a former detective from Philadelphia, can help her clear her aunt’s name and bag the real killer before things boil over …"
Creative Haven Teatime Coloring Book by Marty Noble (coming January 17, 2018). 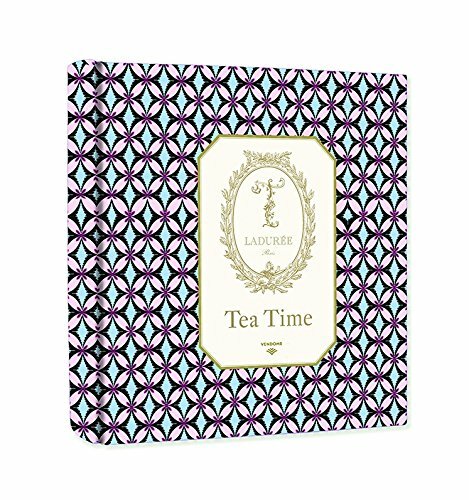 The blurb: "Inspired by historical tea culture and its modern popularity, 31 original designs to color include beautiful tea settings; whimsical arrangements of stacked tea cups and tea pots; and tea-related designs, patterns, and borders. They also include pictures based on vintage tea advertisements. Pages are perforated and printed on one side only for easy removal and display. 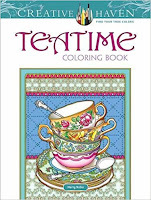 Specially designed for experienced colorists, Teatime and other Creative Haven adult coloring books offer an escape to a world of inspiration and artistic fulfillment. Each title is also an effective and fun-filled way to relax and reduce stress." Ladurée Tea Time: The Art of Taking Tea by Marie Simon, author, Hélène LeDuff, illustrator, and Marie-Pierre Morel, photographer (coming February 13, 2018). The blurb: "Tea time is a moment for sharing, when the mind wanders to faraway lands and calm returns to our crazy world. 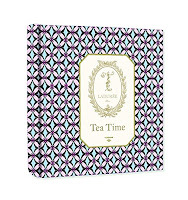 In Ladurée Tea Time, the iconic Parisian luxury patisserie pays tribute to this libation of the gods in its inimitable fashion. With mouthwatering photography and beautiful illustrations, the leaves of this chic book are steeped with tea-time menus and more than 60 sweet and savory recipes fit for Marie Antoinette." 13, 2018). 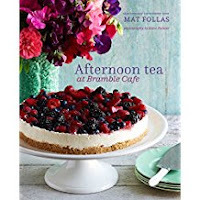 The blurb: "Let Mat transport you to a sunny table adorned with fine china, the sound of birdsong, and the smell of the sea, for his ultimate collection of recipes from his latest book, Afternoon Tea at Bramble Cafe. Here, Mat has honed his unique experience and his passion for food. Recipes for Cakes and Scones include a classic Victoria Sandwich and a local Dorset Apple Cake. Slices and Tarts feature a Bakewell Slice, Individual Treacle Tarts, Bramble Cheesecake, and Raspberry Meringue Kisses. Delicious Cookies range from Lavender Shortbread and Rose Thins to Anzac Biscuits inspired by his Kiwi roots. Try Mat’s specialty Dainties and Patisserie such as Marshmallow Tea Cakes, and Camp Coffee and Caramel Eclairs. For the quintessentially British Afternoon Tea try Savories and Sandwiches including Classic Finger Sandwiches—Cucumber and Mint, Smoked Salmon and Dill, and Egg and Cress—Welsh Rarebit, Crab on Toast, or Cheese Choux. Finally, making the most of the ripest fruit, are recipes for irresistible Preserves and Cordials—a Bramble and Rose Jelly, Orange and Whiskey Marmalade, Lemon and Mandarin Curd, Apple and Pear Cordial, and Mat’s Elderflower Fizz." A Literary Afternoon Tea: 55 Recipes for Savory Nibbles, Bite-Sized Sweets, and Custom Teas for Book Lovers by Alison Walsh (coming June 5, 2018). The blurb: "Tea and books: the perfect pairing. There's nothing quite like sitting down to a good book on a lovely afternoon with a steaming cup of tea beside you, as you fall down the rabbit hole into the imaginative worlds of Alice in Wonderland, The Hobbit, and Sherlock Holmes . . . Fire up your literary fancies and nibble your way through delicate sweets and savories with A Literary Afternoon Tea, which brings food from classic books to life with a teatime twist. 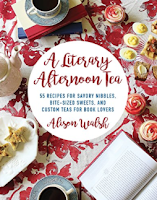 Featuring fifty-five perfectly portioned recipes for an afternoon getaway, including custom homemade tea blends and beverages, you will have everything you need to plan an elaborate tea party. Cook up and enjoy: Turkish Delight while sipping on the White Witch’s Hot Chocolate from The Chronicles of Narnia; Drink Me Tea with the Queen of Hearts’s Painted Rose Cupcakes from Alice in Wonderland; Eeyore’s “Hipy Bthuthday” Cake with Hundred Acre Hot Chocolate from Winnie the Pooh; Hannah’s Sweet Potato Bacon Pastries and Jo’s Gingerbread from Little Women; Tom Sawyer’s Whitewashed Jelly Doughnuts from Tom Sawyer; And more! Accompanied with photographs and book quotes, these recipes, inspired by the great works of literature, will complement any good book for teatime reading and eating." "Outside of Green Bay, the rain stopped, but clouds still hung heavy in the sky. Setting my bags and coat aside, I quickly put the kettle on for tea. I couldn’t calm down or start and finish one thought without new ones intruding. William and I had always made decisions together, from the mundane choices about what to do for the holidays or whether we wanted a flagstone or concrete patio…"
When I was in Wisconsin in June, I visited a Green Bay quilt store that carried a local author's books that caught my eye. First in the series was Quilts Galore by Gini Athey, and I enjoyed it so much that I wanted to share it with you here. Marianna Spencer is just beginning to find her way in life again following the death of her husband, William, two years ago. The two of them used to visit Wolf Creek, a small town near Green Bay, and Marianna decides to visit Wolf Creek by herself one day. There, she finds the quilt store she always liked to visit is for sale, and she impulsively decides to buy the shop for herself. 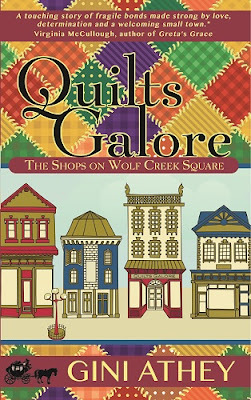 When Marianna moves to Wolf Creek and lives above her newly purchased quilt shop, we as readers soon get acquainted with her neighbors and neighbor businesses, including a jewelry store, a coffee shop, an inn with fine dining, a garden shop, a clothing boutique, and a book store. Meanwhile, there's quite an unexpected turn on the home front. Marianna was William's second wife, and he and his first wife had an adopted daughter from whom he had become estranged. Marianna had never even met the child, but one day, the teenage Rachel shows up at Marianna's door—with a baby—and confesses her mom has kicked her out and she and the baby have been living in a shelter. The messiness of this whole situation has the ring of truth, and I found myself pondering what I would do if such a teenager showed up needing my help yet I had no blood ties to her. I hope I would do as Marianna did and try to help the young woman and her infant son. I like that the author did not make this a rosy, life-is-perfect fairy tale but instead a heartwarming story with the bumps and bruises that are, in fact, part and parcel of life. This book also inspired me to turn my attention back to quilting, or perhaps it's merely coincidence that I pieced more quilt blocks last month than I did in the entire year prior. Of course, I also loved the fact that Marianna, Rachel, and others seem to sip many cups of tea. I know that some of you would enjoy this lovely book as much as I did. Now I can't wait to start the next one in the series!